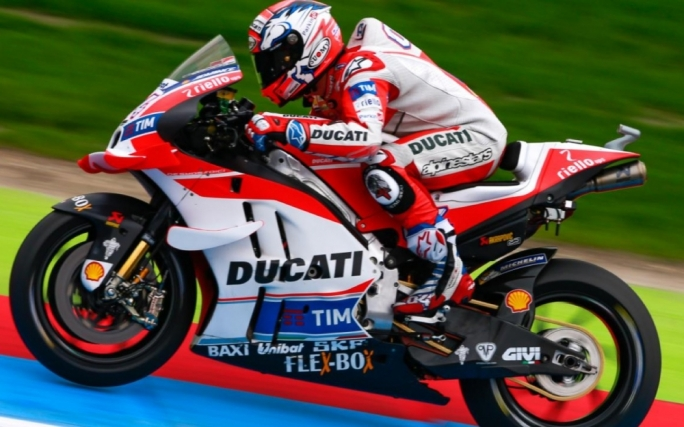 Andrea Dovizioso will start from pole position as his teammate, Andrea Iannone, is scheduled to start from last but the weather means anything could happen. Both FP4 and Q1 had been littered with falls, riders approaching Q2 with a healthy amount of caution during their first laps. The rain had eased but the track was clearly still too wet for slick tyres, resulting in the first wet Qualifying session of the new Michelin era. For just the fourth time in his premier class career, Andrea Dovizioso (Ducati Team) will line up in pole position. Conditions were incredibly tricky but ‘Desmo Dovi’ showed his skill and experience to set a 1’45.246 to take pole by over half a second. This is his third pole while riding with Ducati, his last coming in Qatar back in 2015. Andrea Dovizioso’s lone MotoGP win came at the British GP in 2009 in wet conditions, he could be on course for a second one if the rain remains. It proved to be a good day for Italians as Valentino Rossi (Movistar Yamaha MotoGP) took second on the grid. Like Dovizioso, Rossi is known for his ability when the conditions are less than ideal. With both Marquez and Jorge Lorenzo (Movistar Yamaha MotoGP) having less than ideal sessions and starting down the order, Rossi has an excellent chance to close the 22-point gap in the championship. Leading the Independent Team charge and rounding out the front row is Scott Redding (Octo Pramac Yakhnich). The Brit will start from the front row for the first time in the premier class, his last front row coming at the British GP in 2013 when he was battling for the Moto2™ World Championship. This comes as a welcome confidence boost for Redding who has been hit by a number of technical issues early in the season. A relieved Marc Marquez will start the Motul TT Assen from fourth place, not quite able to re-create his magic wall-jumping pole from Austin. Given the circumstances it certainly could have been much worse. Just behind Marquez is fellow Honda rider Cal Crutchlow (LCR Honda). Completing the second row is Yonny Hernandez (Aspar Team MotoGP), the Colombian inside the top ten on the grid for the first time since Germany in 2015 when he was fifth. Pol Espargaro (Monster Yamaha Tech 3), Aleix Espargaro (Team Suzuki Ecstar), Andrea Iannone (Ducati Team) and Danilo Petrucci (Octo Pramac Yakhnich) completed the top ten in the session. Andrea Iannone was ninth but will start Sunday’s race from last due to his penalty from Catalunya, moving everyone else up a position. Jorge Lorenzo (Movistar Yamaha MotoGP) will need any bit of help he can get after only managing 11th place in the session. There’s a lot of work to do for the factory Yamaha rider from tenth on the grid, his up and down love affair with Assen continuing.